On deadline for the next issue of GRID magazine, I trotted out the fall/winter hats and rediscovered this one, purchased by my father. Yes, that’s a B² logo on the box and inside the crown. It was purchased around 1980, as I recall, to go with his double-breasted camel’s-hair polo coat. I’m not sure he wore it more than once or twice in the seven years he had left. This entry was posted in Elegantology and tagged brooks brothers, GRID Magazine. Bookmark the permalink. That’s a great looking hat. Last night I watched The Man in the Grey Flannel Suit, with commentary. The hats worn by the men in the film were discussed and it was quite interesting. Most working class stiffs in the 50’s wore Fedoras (as did Gregory Peck in the film). However, the executives and CEO’s graduated to another style that begins with an “H” that I cannot recall. Class status by hats! I could barely see the subtle differences between the two styles but maybe you could. I love wearing hats: Peter Beaton in the summer and felted wool cloches in the winter. What do you think of hats on women? Does it make us look eccentric or charming??? I wore one recently to a funeral and was told I looked like a little “China doll”. Oh, man. I love that hat. Beautiful. 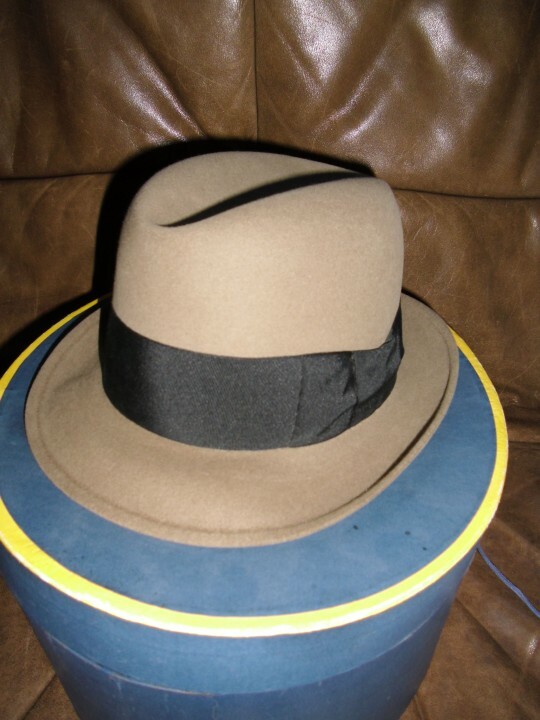 I too bought my hat for my camel polo coat in 1986 at Chicago’s Capper and Capper. I still have it but it pales in comparison to your fathers. By the way, that’s a great photo. Tell people it’s out of focus on purpose and you can start selling them. 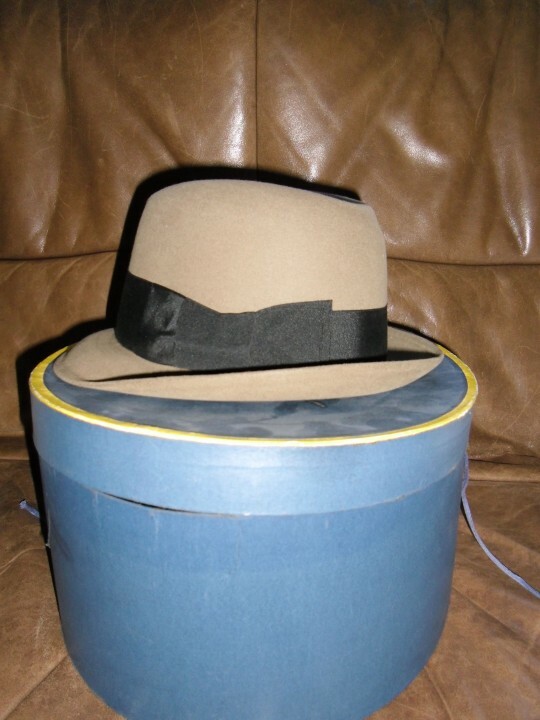 I still have the box that used to house my dad’s Stetson. Not sure what happened to the hat, which he wore during the filming of the movie “Giant” in 1955. He cut the job short to return home for my arrival. Wouldn’t trade that box for anything. Dad bought Dobbs hats from a local menswear shop, and they were the only item of clothing that fit both of us. After he died in 1979, I gave them away, assuming I’d never be a hat wearer. Of course, I’d now love to have a couple of true sized, high quality 7 5/8 snap brim fedoras, for less than a couple of hundred bucks, but guess what…? I am completely charmed. Nothing is better than holding a prized possession of a loved one in the hand . . . or in your case, on your head! I have my grandpa’s hat pins. How would they have been worn? Grandpa Boke always wore a hat. Always the gentleman. America needs more of that right now. I love the hatbox, too. Life is better when it involves a hatbox! Imagine traveling with hatboxes! Renee, I’m happy to have found it again! Paula, Mrs. E. travels with a train case, But we have yet to pack a hat box for the trip out. She has several, at least one of which was carried on a flight home though. NCJack, I’m a bit of a pack rat when it comes to clothing. I’m glad now. His coat fits me too. Yoga Teacher, Now that’s quite a story. Lucky you didn’t wind up being named Jet. Or did you? Tintin, I can’t decide if it’s a bit small, but I’ll wear it anyway this winter. It is a beauty, if a bit faded nowadays. Donna Besse, I’ll have to start listening to the commentaries on the DvD’s! The style to which you refer is call a Homburg. 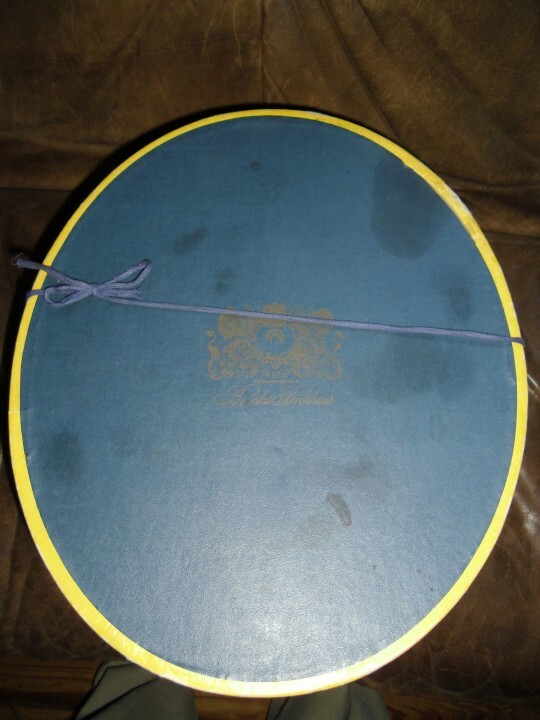 Typically it has a bound brim that curls up instead of snapping down and a creased crown. I love hats on women and would like to see more of them worn! Mrs. E. has a cloche or two and several beautiful straws with large brims. With the right clothing and shape for your face, hats make you look sophisticated and charming. At least in this man’s opinion. I love your pictures. How wonderful that you still have the box. And now I’m curious to hear more from Yoga Teacher! “Giant” is a favorite of mine. Chris, I highly recommend the director’s commentary when watching old films. They always talk about the fashions, their implication to the film’s place and time. Also, the costumer is always mentioned, Edith Head et al. Really adds to the enjoyment of the film from a fashionista’s standpoint. 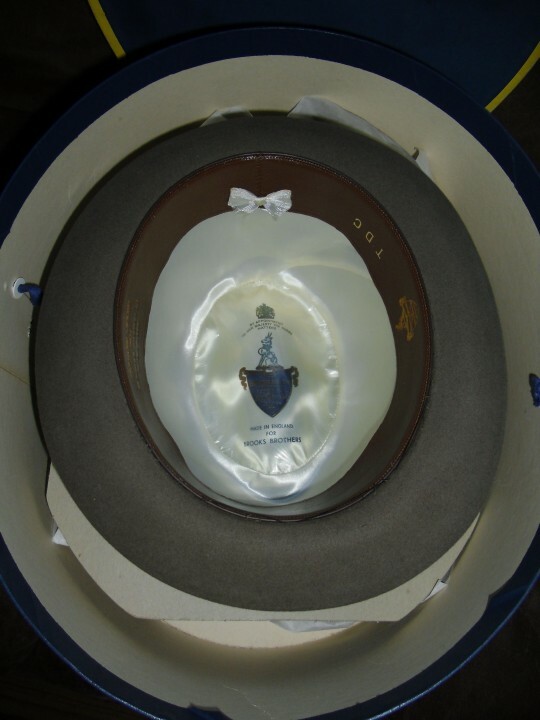 I bought years ago a hat for my husband – it needs to be brought down off the shelf and out of the box! My brother’s initials are J.E.T., but surely a coincidence. I remember my dad saying he couldn’t stand James Dean. Often late to set and always obnoxious. He liked E. Taylor, and said her eyes were never really captured on film and they really were violet. Wish I had asked more questions. Alas, too late. Now I want to watch the movie again, with an eye toward the costumes. Courtney, that’s kind. If you want to see photos done really well, check in with Tintin at The Trad! Yoga Teacher obliged! Mrs. E. will be thrilled, too. Great photos! My Dad passed in 1948, was a fabulous dresser, as were many at the time. Left more hats than I could count. Black Derby for evening wear of course. Could kick myself for not saving a single hat. 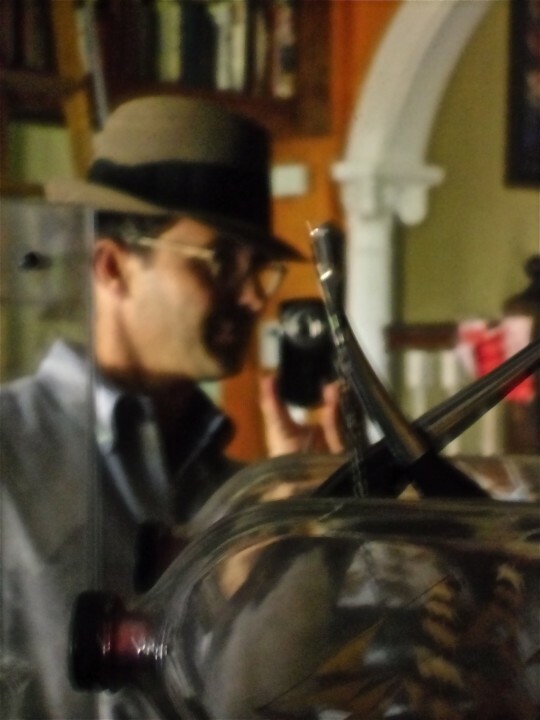 Tho I/we wore hats frequently thru the 1950’s and barely into the 60’s. It was a cultured time – and I’m pleased to have lived during those times. Welcome Denali! You are fortunate. Keep fighting the good fight.